Mark Selby won PTC 4 (Paul Hunter Classic 2011) by beating Mark Davis 4-0 in the final after his comeback against Ronnie O'Sullivan. Selby has no more regret in Germany. In February's German Masters in Berlin, Selby lost 7-9 to Mark Williams in the final to miss his second ranking title. This time Selby managed to win in 'Marks' final to triumph in Furth. This is Selby's second title in two months time after winning Wuxi Classic last month. 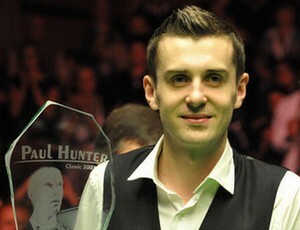 The Leicester man nearly lost to Ronnie O'Sullivan in the semi-finals, who made maximum in the first day of the event. The Jester battled to the final by 4-3 victory over the Rocket from 1-3 down. I will say Selby is a jinx to Ronnie as he won their last three meetings and they were all comebacks but great effort from Ronnie in this Paul Hunter Classic, he tried to enjoy and entertain the crowds. Well saying from Ronnie on Twitter: 'Good weekend of snooker for me.. To be honest I was more pleased with my attitude, then anything else. Its all about the mind now, learning to handle the not so good times is the key to sucsess.. Some do it better then others, I am learning'. Please Keep going Ronnie. I wish you will travel to Shanghai. Runner-up Mark Davis had a disappointing performance in the final. However he deserved the final place on account of winning over Robertson 4-2 in the semi-finals. The 39-year-old player best finished in quarter-finals of Shanghai Masters last year so the final of PTC4 would be a breakthrough for Mark. Perhaps his first round victory over Judd Trump in Bendigo helped Mark to boost his confidence. You cannot overlook the potential of Yu Delu. This new comer almost turned over his lost in quarter-final agaisnt Ronnie. Yu repulsed Ronnie from 0-3 down to force a decider, only lost in the decider. Yu was the quarter-finalist of PTC2. Yu is currently at seventeenth of Order of Merit. It will be great for Yu to qualify for the Grand Finals. No player can resist playing under this great atomsphere! I LOVE the German crowds. Enormous size of the crowds even on the Sunday morning, the size is comparable to German Open though PTC 4 is only a minor ranking event! The clapping and clapping of devoted and enthusiastic crowds are always the most exciting atmosphere that players dream of. More ranking tournaments should be staged at Germany! Lastly thank you Eurosport for the coverage of Paul Hunter Classic! Thank you for bringing snooker fans the first TV coverage of PTC that in remembrance of Paul Hunter - the young talented player who gone too soon.